The Addams Family trading card set was produced by Donruss in 1964, highlighting the hit television series "The Addams Family". The black and white show ran for two seasons from September, 1964 through April, 1966. This comedy is based on Charles Addams' cartoons, which appeared in the New Yorker and featured such characters as Morticia, Gomez and Uncle Fester. The front of each card has "The Addams Family" logo, the card number and a clever pun in red. 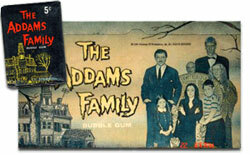 The back of the cards form a gigantic puzzle of the Addams family. 2    Somebody Drank My Embalming Fluid! 3    Feeding the Tropical Fish! 4    Will the Real Granny Please Stand Up! 6    I Always Look Better By Candlelight. 7    I'm Your New Neighbor! 8    Ever Seen a Train in Orbit? 9    Of Course I Play the Piano! 10   This Will Stop His Headache! 12   Only 3 More and the Cemetery Is Full. 13   Next Time—Use Your Zip Code! 14   Want Some Lizard Soup? 15   Your Slab Will Be Ready in a Moment. 16   I Really Dig You Morticia! 17   Got Any Ghostly Numbers? 20   Don't Move, You'll Spoil My Shot! 21   Here He Comes... Now Do Your Stuff! 22   Yes, We Have a Room for Rent! 23   I Can't Stand a Lumpy Mattress! 24   I Always Use Live Bait! 26   He'll Get the Point Now! 27   Your Kids Ate My Spiders. 28   A Few More and We'll Have Our Own Boot-Hill. 29   Yes, the Real Estate Is Getting Cheaper. 30   Of Course I Ride a Broom! 31   It's So Nice and Gloomy In Here! 32   What Do You Mean—Get a Receipt? 33   What'll I Wear for Halloween? 34   A Friend of Lurch. 35   I Always Play in Poison Ivy! 37   Just Think, Our First Dead Letter. 38   Let's Tell Scary Stories. 40   It Only Hurts When I Cough! 42   It's Only the Monthly Bill from the Blood Bank. 43   Bury the Next One over There! 46   I Need a Real Hair-Rising Story. 49   Weaving a Wig for Fester. 50   You're a Real Cut-Up Fester! 51   My Favorite! Devil's Food Cake. 52   Whaddya Mean, I Need a Man's Deodorant? 53   Son, Now Don't Scalp Fester! 54   Get Their Vote (Dead or Alive). 56   I Won't Be Home for Dinner! 57   Lurch Lower the Body so Beautifully! 58   Let's Eat Before He Wakes Up! 59   Come on in the Playroom and See Our Guillotine. 60   What Do You Mean, Follow You? 62   Hang Around and I'll Call the Butler! 63   Go Past the Second Grave and Turn Right. 66   Quit Shaking the Coffin!